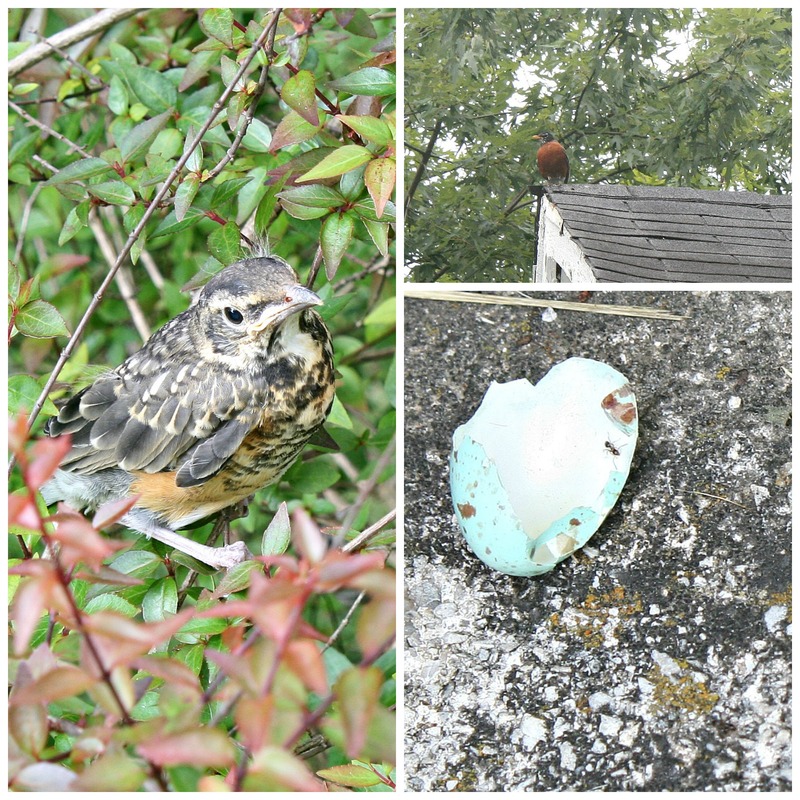 Summertime @ 423 E Emerald Ave.
We have been running a bird nursery this summer! Mockingbirds, sparrows, robins, cardinals and surely some wrens. Robins in the tree nestled among honeysuckle vine with cardinals about two bushes over. The mockingbirds had the cedar tree with sparrows in a niche on the back porch eaves and another one is busy with the second brood in the front porch gutter. When I was weeding one day, the baby robin perched on a flowerpot and then flew to a bush. I don’t know if he carried his old “house” with him. but it was on the step where he first stopped. I got my camera and walked towards him for a picture which set off the parents…not only the robins, but cardinals also. They fussed and watched closely till I left. 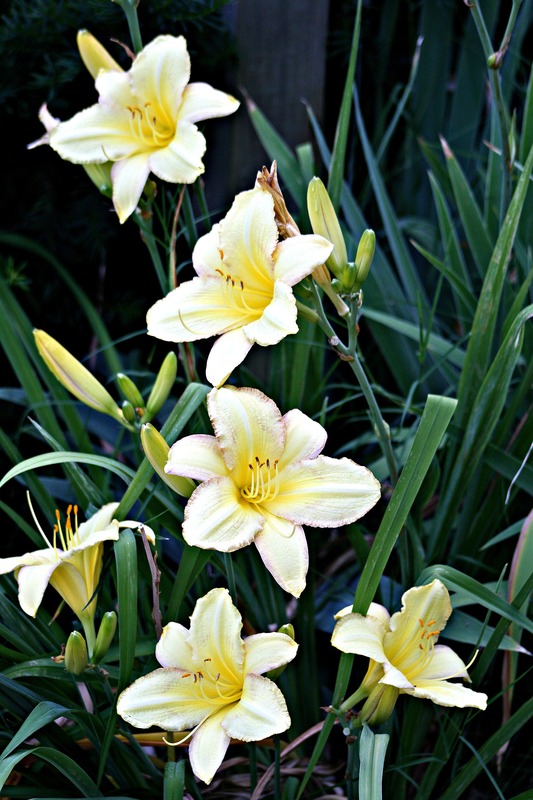 Day lilies just keep coming on, and Jayne’s tomato plants are going to overtake the house! Between them and my one pepper plant and one cucumber plant, we figure we’ll be hitting a Farmer’s Market by mid-July. 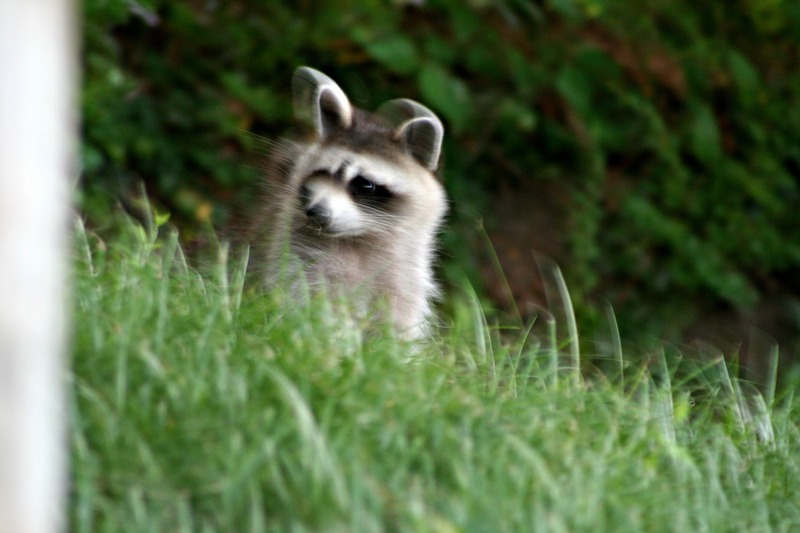 Yesterday I saw this young raccoon at the side of our neighbor’s house. It was still daylight. He stopped when he saw me and when I didn’t move, he went to the trash can without a cover to check it out. He did decide to scoot away when I started snapping. 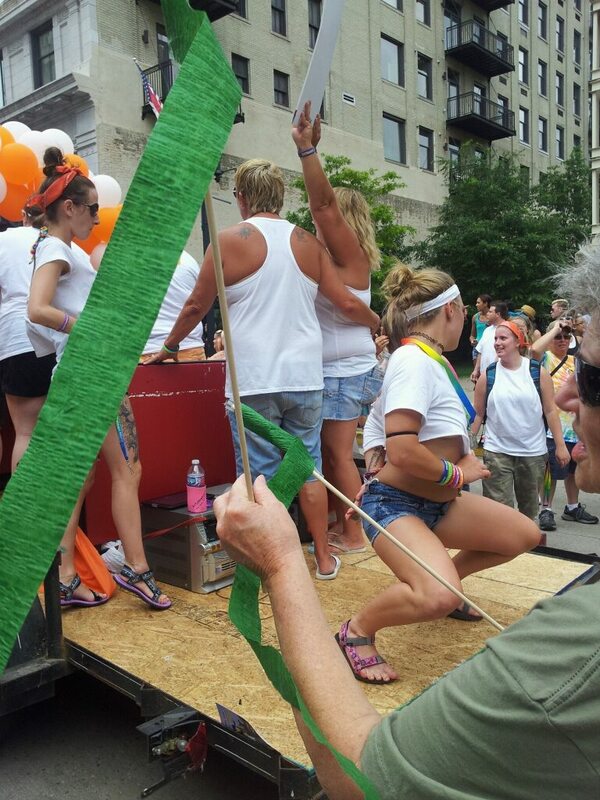 Today I took my place in Knoxville’s Pride Parade, the colorful jump-start to PrideFest, an annual event to promote equality and inclusion of all people. Our group, KnoxZine, stood behind a float loaded with young, gyrating lesbians and in front of very tall crossdressing Carmen Miranda imitator. The only attention getters for us were the t-shirts we wore and Bruno, our handsome 14-month old Newfoundland who calmly took in the ooohs and aahhhs of the cheering crowd. 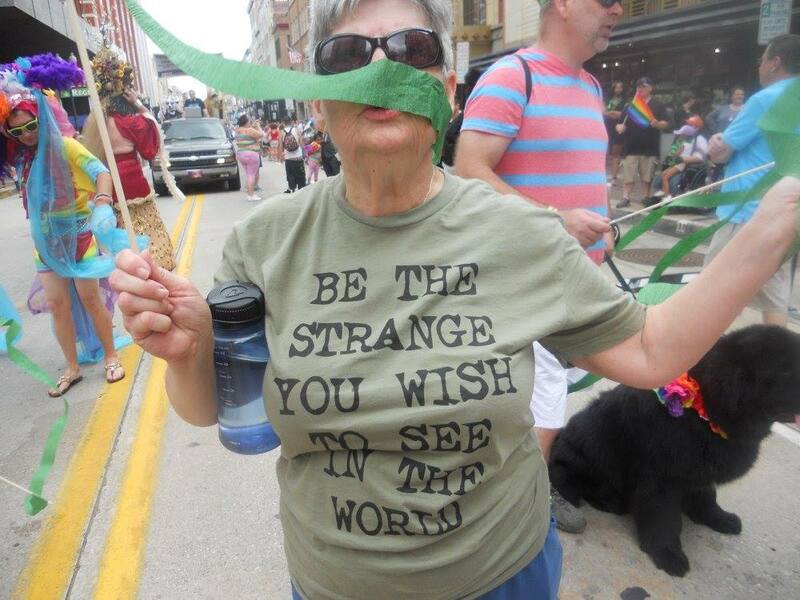 What drew me, a straight person, to join in this parade? I like being in the middle of something different from my norm. Participating is an easy way to absorb the unfamiliar, and an informal, fun event like today’s is very inviting. An unexpected plus was watching the people on the sidelines, waving and cheering us on This euphoric feeling came over me–like I was Pat Summit leading all the Lady Vol athletes on a victory march. I’m glad to live in a city that promotes the rights of individuals to express themselves without fear. What Do You Say To a Panhandler? I’ll admit I feel irritated at the request, but start digging around to see if I have any change. Along with being irritated, conflicting feelings arise: We are taught to be kind and to treat others as we want to be treated; we are also taught to stand on our own two feet so why is someone asking me for money? To top it off I get a guilty feeling (Southern women feel guilty about everything.) because I live a better material life than this person. The last time I was approached on Market Square Mall. I did give the man a dollar. He then started down the row of benches looking for more givers until the policemen on bikes talked to him and he left. I wandered down to where Michael Davis, the Vendor Coordinator for The Amplifier, Knoxville’s street paper, had set up for the day. The vendors for this excellent publication are former homeless individuals. But how do I know it won’t go for food? What about the person standing at the interstate exit with a sign asking for help? The woman in the grocery store parking lot wanting money to buy diapers? Or the young kids with their backpacks who need money to get back home? What will I do from now on for the person asking for a handout? Be kind in my refusal to give money. Keep cracker snacks or fruit or water with me so I can offer something. Educate myself on the names, locations and services of professional helping organizations to pass along. I need to fit my action to what I believe I should do and leave the panhandler to do the same.